Who wants to win a free booK? Well here’s your chance! Welcome, everyone, to my new blog. Yes, I’m back after four years away. I’ve missed you, my friends in the blogosphere. Have you missed me? No, of course you haven’t. Too bad, I’m here anyway, and to soften the blow, I’m giving away some books. I’ll be posting about a mixture of topics. Books of course, mine and other people’s; writing, ditto, and guest posts from other writers; history, especially ancient Roman. Then how about “shoes and ships and sealing-wax, and cabbages and kings, and why the sea is boiling hot, and whether pigs have wings.” in my last series of blogs I certainly covered shoes (if you count Wellington boots,) and ships (the voyages of Pythias the ancient Greek explorer.) This time…who knows? I daresay pigs with wings will turn up. Oh yes, Walrus, they do exist; how often have I been watching some politician strutting his stuff on tv, and observed porkers looping the loop joyously in the background? First of all I’m offering the chance to win a free book. 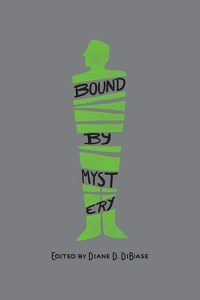 Three chances, actually, as I’ll be giving away three copies of BOUND BY MYSTERY, the amazing anthology that Poisoned Pen Press brought out earlier this year. The 30+ stories are a real mixture, with settings from all over the world and periods from modern to ancient. One of the latter is a story of mine, WILD BY NAME, WILD BY NATURE, set in Roman Britain, like my novels, and tells of the night when innkeeper Aurelia Marcella has a surprise celebrity guest, a famous gladiator. I’m delighted to be part of this book. Some of my very favourite authors are in it. And I love short stories. They’re fascinating to read and fun to write, the ideal form for mystery ideas. They are a subject I’ll be returning to in a future post. Which are my favourite short stories? Which are yours? Meanwhile, winning a bumper bunch of them needs no big brain-teaser, just a prize draw. Everyone who posts a comment on my blog between now and midnight on August 31st is automatically included. Your names will be put into a hat or mug or dustbin – whichever container is suitable – and three winners will be drawn out on September 1st, and announced here. Then I’ll need your snail-mail addresses, and the books will be on their way. Watch this space. I’ll be with you again before the end of the month., because I want to show you the view from my office window, which has been keeping me entertained all summer long. When I need a break from writing, (only very very rarely of course!) I look out and…I can spy with my little eye, something beginning with S.
Glad to see you back, Jane! 🙂 I look forward to following your blog! Thanks, Ann, good to hear from you, and you’re in the hat! I really enjoy your books! I love the way you’re careful to be accurate about things Roman without being dry and boring. In fact, I find your characters both engaging and believable. Thanks! Mari, good to hear from you, and thank you for your kind words. You’re in the hat! Welcome back! I really enjoy your series, and would love the chance at the anthology. Thanks from another Jane! Nice to hear from another Jane – thanks for joining me, and you’re in the hat! Sounds like a trip to the mysterious buffet, a delicious treat! Hoping my name doesn’t end up in the dustbin all alone! Thanks for the offer! Thanks, Linda, you’re in the hat! I like the idea of an anthology being a kind of buffet…as long as one doesn’t push the analogy too far. I mean I love variety, yes, and items from all over the world, yes, great…but a historical buffet? I suppose if it just meant recipes from the past, not actual old food, that would be fine too! Sadly I have had to order your books from afar,the American Colonies to be precise. Love them. If the contest is international I live at !8 Boulder Court, Mystic ,CT 06355 USA. If not tell me how I can get these tomes. Please. Ruth Downie suggested they would be good reads, and they are. Thanks, Taff and Laura, you’re both in the hat! Welcome back to blogging, Jane! I hope to see you again at Crimefest 2018! Thanks, Georgina, you’re in the hat! Yes, I certainly plan to be at CrimeFest 2018. Congratulations on the new website, Jane – I look forward to your blog posts. Especially the pigs with wings! Thanks, Ruth, you’re in the hat! And thanks for agreeing to do a guest post on this blog later in the year. Hi Jane! It’s great to see you online again and the new website looks really good. The PP anthology sounds great too. Thanks, Dolores, you’re in the hat! And thanks for agreeing to do a guest blog post for us later in the year.